The Maelanoi Sub-district Administrative Organization is resided at 105 Moo 10, Tambon Maelanoi, Maelanoi district, Mae Hong Son province. It was formerly the Tambon Council under the name of Maelanoi Tambon Council and then elevated to become the Tambon Maelanoi Administration Organization in 1999 to comply with the Tambon Council Acts. As a result, it is considered as the juristic person and a local government office. The Maelanoi Sub-district Administrative Organization covers the land area about 365 kilometers or 288,125 rai. The North share its borders with Tambon Santikiri, Tambon Maelaluang, Maelanoi district. The South shares its borders with Tambon Taphapoom, Maelanoi district. The East shares its borders with Tambon Huayhom, Maelanoi district. 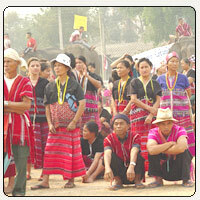 The West shares its borders with Tambon Saohin, Mae Sariang district. The general landscape is blessed with high hills. Nine villages can be found along the valleys where other two villages are on the plain. The cool weather is all the year round. The rainy season lasts for about five months from May to September. The average temperature is at 22 degrees in three seasons; rainy season (May-September), cold season (October-February), and summer (March-April). The Tambon Maelanoi Administration Organization consists of 11 villages, totally 824 households with 4,771 residents divided into 2,506 males and 2,256 females. The majority (90 percent) of residents live their lives by agriculture with 10 percent by selling and seasonal laboring.